The ability of every person and child to be attentive in a special way: to be conscious and present in a friendly way, in every moment, without judgment, conscious of the urge to react. What is 'A Head-Heart Start for Life'? - how to concentrate, stop what they are doing for a moment and concentrate on their breathing for instance. 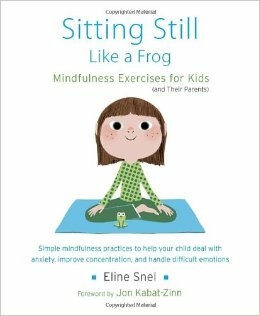 By regularly practicing ‘sitting attentively like a frog’, children learn how to switch quickly between ‘doing’ and ‘not doing’. They will learn to notice when they are being distracted and how to bring their attention back to the matter at hand. This increases their concentration and reduces impulsive behavior. - to name and understand emotions and thought processes, such as fear, anger, sadness and anxiety. By accepting and creating space for thoughts and emotions, you create a bit of distance from them. Just enough to prevent yourself from being carried away by them or from ignoring them. This creates calm and harmony. - to be present in the here and NOW, so that children notice that a lot of things are good right now. Even when exciting or nasty things happen. NOW is OK! - to be confident, by letting go of judgments about your own thoughts or emotions. By not identifying yourself with what you think or feel. And by the open and non-judgmental attitude of the trainer, teacher or parent. - to improve the memory, by focusing your attention on the here and NOW, things are better able to get through to you, and you are better able to remember what you have learnt. - to be kinder to yourself and others, you increase your ability to understand your own point of view or vulnerabilities as well as those of others. By practicing compassion and being nice, children realize the value of mindfulness. Awareness of this quality reduces bullying and increases tolerance of differences. Here is the power point presentation for Parents. This is great resource for families to use at home.